So, yesterday I decided to move my ten foot trampoline to the other end of the garden, 'cause I wanted my garden swing where the trampo was. 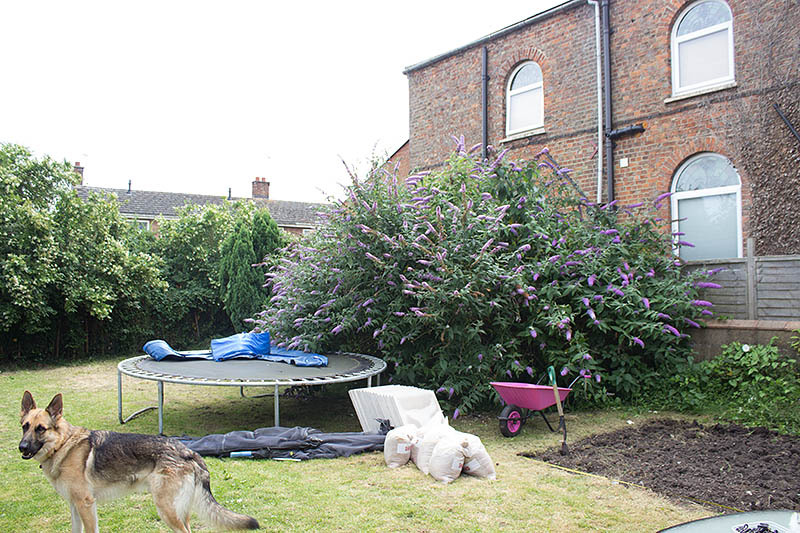 Easy, thinks I. I'll move the trampoline and then throw some grass seed down in the bad patch. Well, with the help of a hammer, a tin of WD40 for the rusted wing nuts and brute force, I finally got the trampoline down and moved, although it's still not where it's supposed to be yet 'cause, me being me, had another of my whims. Ah, thinks I, my table and chairs would actually look nice over there too but....they'd look better on a little patio. 10' x 8' should do! Hmmmm!! Slap my wrists very hard. At the same time as this, I'm clearing the shed out. Anyway, here's some pics of my progress, such as it is, lol. The bit where the trampoline stood. 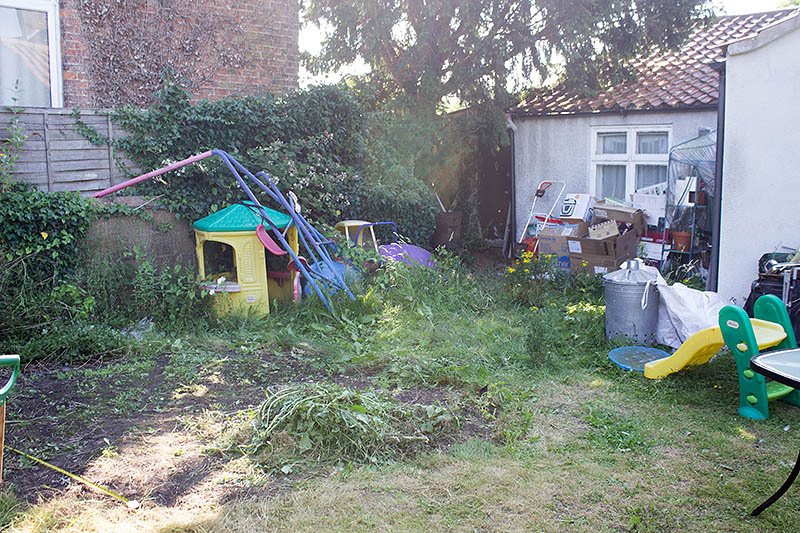 The old, neglected garden toys and some of the rubbish from the shed. Goodness knows how many trips to the tip this lot'll take me, and it's not finished yet. 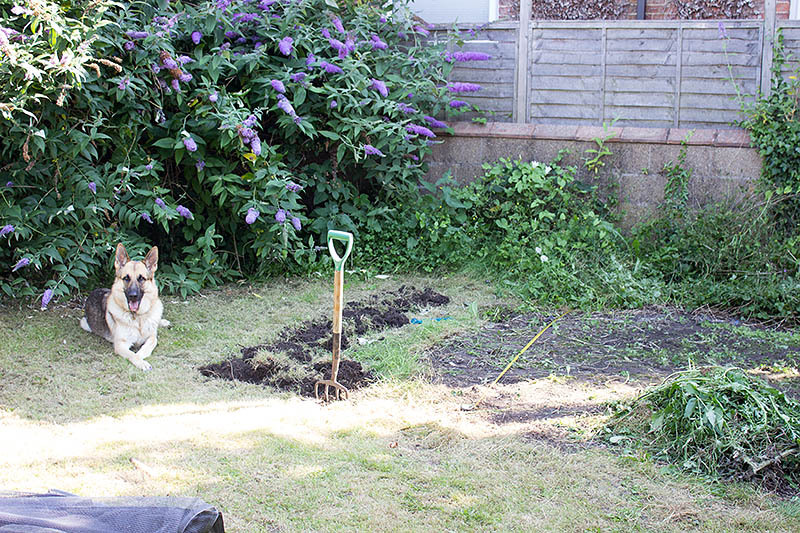 My 'just started and already knackerd' dig, so I stopped and went in. Starting today and good progress turning the soil over. The buddleia is huge, so when the pavers are down, that has to come down too. It's so tall, it completely blocks one of the church windows. 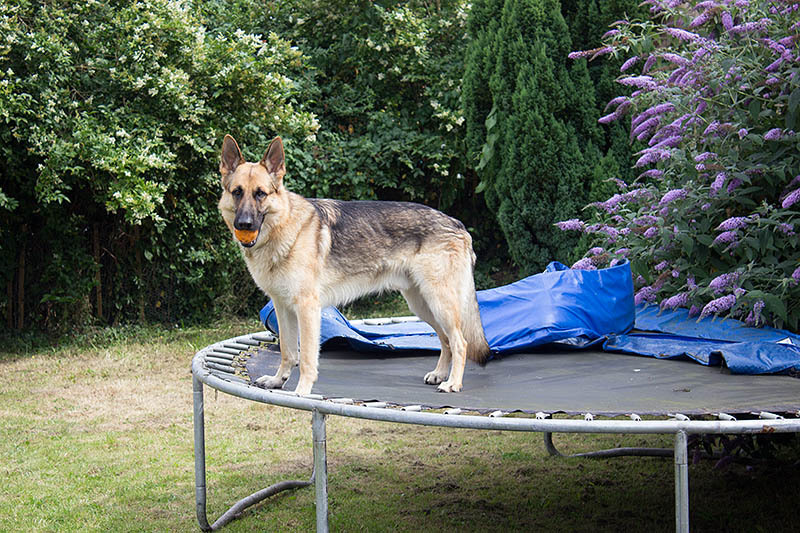 Saxon thinking it's play time because his ball landed on the trampoline. But, I have to say, I LOVE this pic. 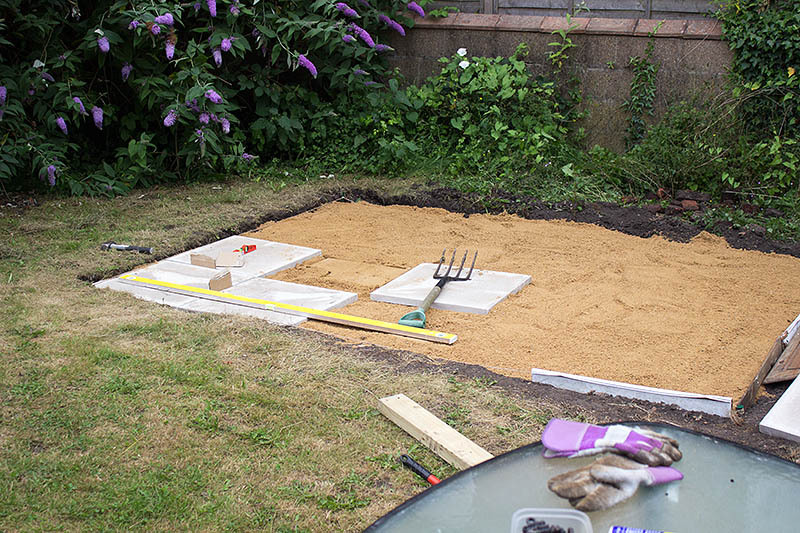 At 8.00 this evening, I was too tired to do any more, but tomorrow, weather willing, my hole is ready for the sand. You want to see the pile of soil just out of shot..it's huge and I'd already dumped half a dozen barrow loads around the garden. I can't believe how much soil came out of such a shallow hole. Well done you, a lot of hard work done already. Wow! You've done a huge amount, Lorraine - well done! Bet it will look great when it's finished. You could probably just prune the buddleia: neighbours across the road have one at the front and they keep it in check by pruning every year. 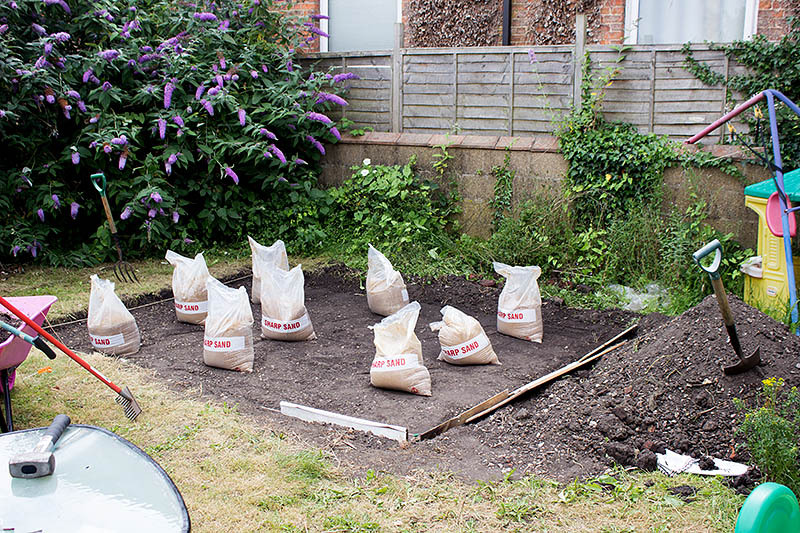 First 9 bags of sand. Thought it would be enough, but had to go get another 9. End of play yesterday. Just couldn't do any more. It looks like it's sloping, but it's not. It's perfectly level. It'll look fab when it's done, Lorraine. It measures 10' x 8' and front to back is perfectly level. Left to right has a really gentle slope for runoff, but you can't see that it slopes which I think is the idea. All I have to do now is brush in the cement filler in the gaps and sort out around the edges. I'm not sure what to do with the edges though. My grass is so uneven. It's almost level with the slabs at one end, but about 4" higher at the other. Still, I'm sure I'll sort it. 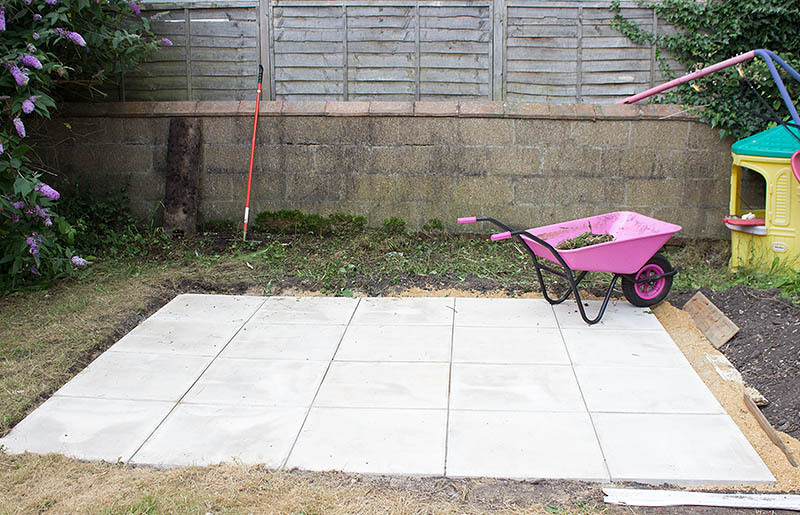 Not in the habit of blowing my own trumpet, but for a 61 year old, unfit woman who's never laid slabs before, I'm pretty darned chuffed with myself. So you should be, well done. That's superb, Lorraine! Not sure what you can do with the edges either. 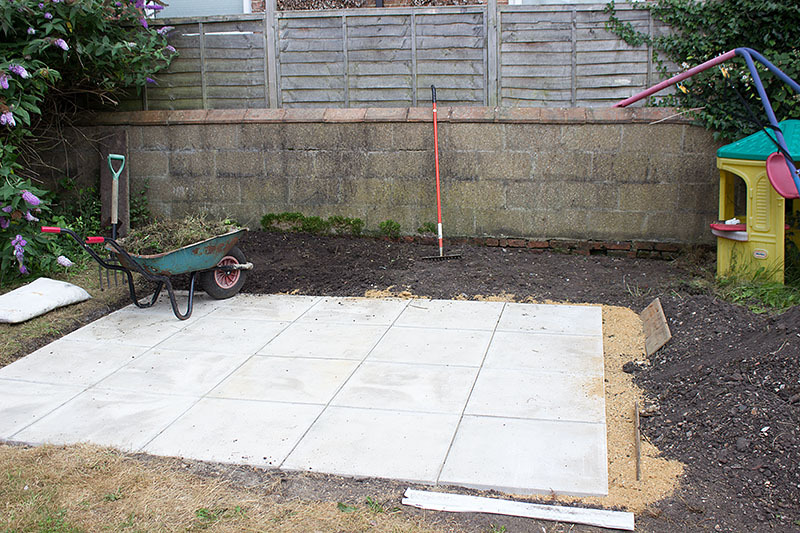 So very knackered today, I couldn't bring myself to do much of anything, but I have made a start clearing behind the slabs. 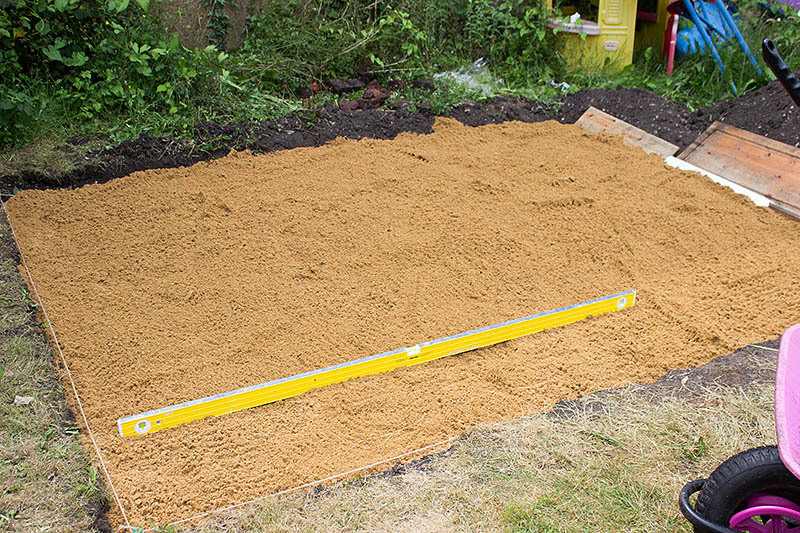 Now I can see what I'm doing, I can dig it over and grass seed it and will be able to make a gently slope up from the slabs. 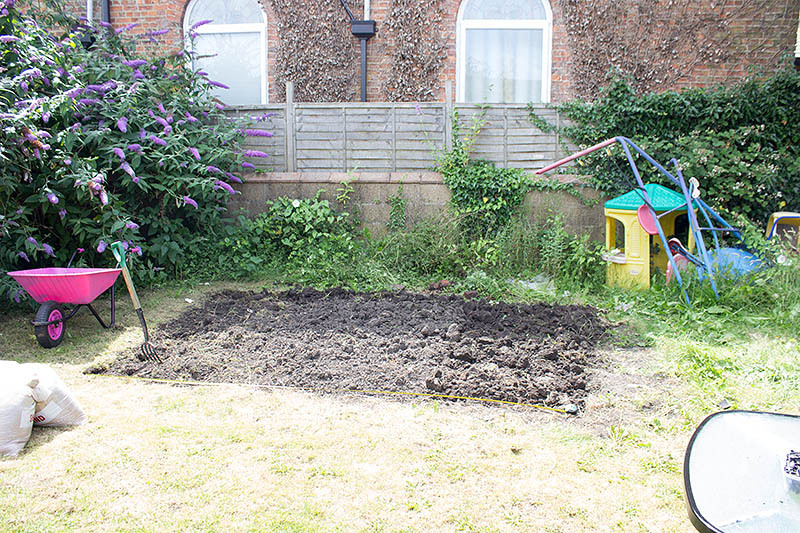 I thought about a flower border, but then thought I didn't want to sit there with bees all around me, so grass it is. I've also realised that I can't trim the buddleia from outside, so I've chopped a chunk off on the left of pic and I can get inside and under it to chop a pile away. Couldn't do much of anything, eh - sounds like quite a bit to me! You need to be able to sit out on that patio, if you ask me! 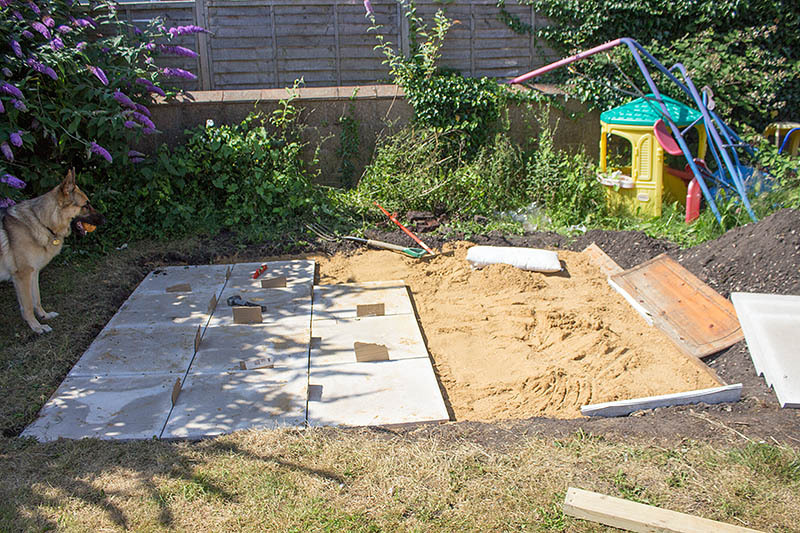 You could plant some more slabs?! What an amazing feat, great stuff, well done, a great spot for you, a good book and a glass of something. Wow you are doing really well with it all. 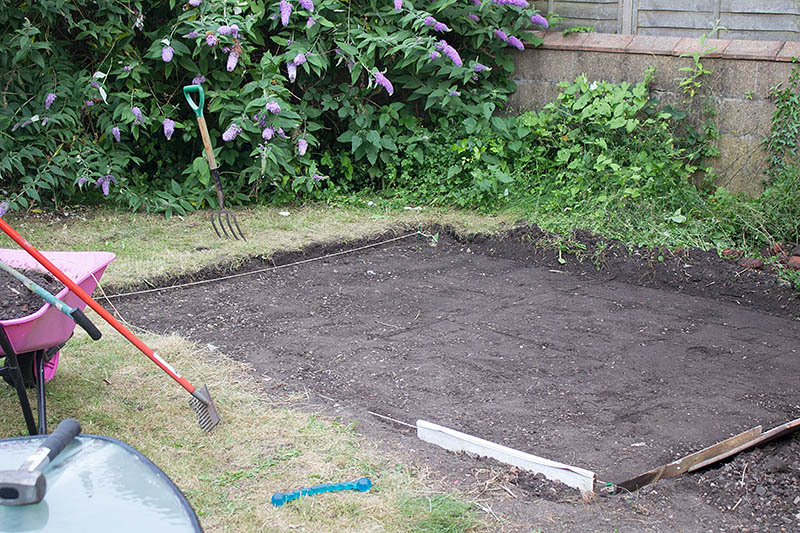 Perhaps you could put small stones down instead of grass, will be a pain to cut the grass and stones/chippings can be weeded easy and you could put a planter or ornament on the stones. Don't cut to much from the buddleia just now the bees and butterflies need the flowers, and its pretty, :) Anyway, as said you need a good book and a glass of something to enjoy your hard work. How about some low growing, non flowering shrubs? I would love pebbles or slate chippings, even shrubs. But, whatever I do has to run the whole length of that side of the garden to match up and unfortunately, I just can't afford anything like that, so it'll have to be grass. 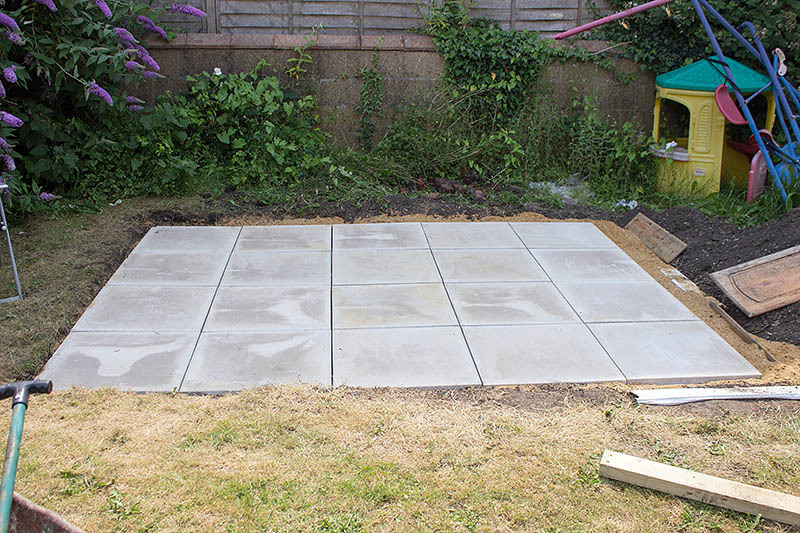 Anyway, I've got behind the slabs all weeded now. The next step is to move all the rubbish over on the right and continue the line. I was going to lay seed today but as I'm not going to be here for the next 2 days to water it, I'll leave it until Friday. When the right side is done, I'll tackle the buddleia. 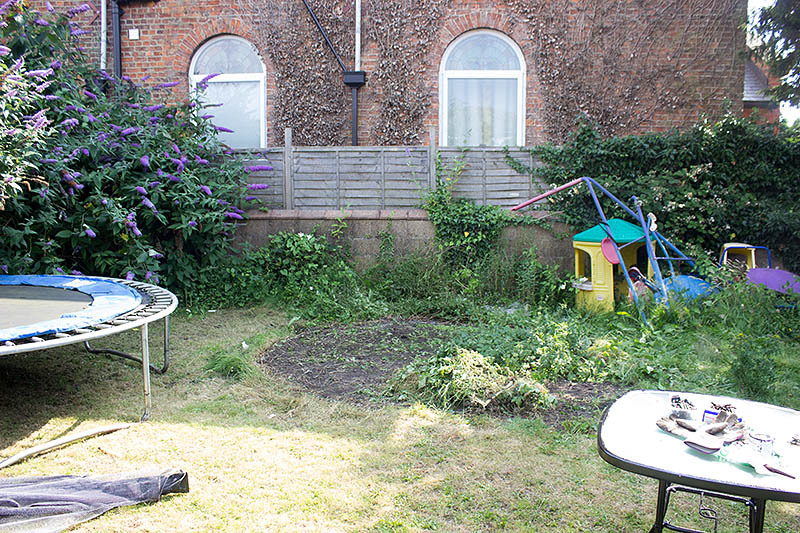 Ah, I've never worried about bits of garden matching up. Have fun with the grass. aww ive just seen this, Lorraine its brilliant, im so impressed and its utterly fabulous to see you having the motivation to tackle and complete this. and what a lovely result you have for a reward. And how far you have come with Saxon too, when you remember how difficult he was and how he wrecked the garden and now hes helping and keeping you company. Im so impressed with all this. Re the buddleia, in the spring you can cut it down to a foot of the ground and it will grow back tall. looking forward to seeing this finished with chairs and table on it and you relaxing at the table with a glass of something. I have just seen this what a great job you are doing, don't over work though or you may not be able to enjoy it all. Getting on well here. Got that buddleia down today. It's really opened the space up. More pics will follow, Ruth. You have been working hard Lorraine, it looks great.